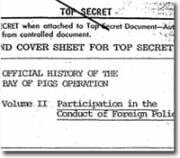 This episode of ‘friendly fire’ is one of many revelations contained in the Top Secret multi-volume, internal CIA report, “The Official History of the Bay of Pigs Operation.” Pursuant to a Freedom of Information lawsuit (FOIA) filed by the National Security Archive on the 50th anniversary of the invasion last April, the CIA has now declassified four volumes of the massive, detailed, study–over 1200 pages of comprehensive narrative and documentary appendices. Although the CIA had been admonished by both the Eisenhower and Kennedy White House to make sure that the U.S. hand did not show in the invasion, during the fighting headquarters authorized American pilots to fly planes over Cuba. Secret instructions quoted in theOfficial History state that Americans could pilot planes but only over the beachhead and not inland. “American crews must not fall into hands enemy,” warned the instructions. If they did “[the] U.S. will deny any knowledge.” Four American pilots and crew died when their planes were shot down over Cuba. The Official History contains private correspondence with family members of some of the pilots. A small group of high-level CIA officials sought to use part of the budget of the invasion to finance a collaboration with the Mafia to assassinate Castro. In an interview with the CIA historian, former chief of the invasion task force, Jacob Esterline, said that he had been asked to provide money from the invasion budget by J.C. King, the head of the Western Hemisphere. “Esterline claimed that on one occasion as chief/w4, he refused to grant Col J.C. King, chief WH Division, a blank check when King refused to tell Jake the purpose for which the check was intended. Esterline reported that King nonetheless got a FAN number from the Office of Finance and that the money was used to pay the Mafia-types.” TheOfficial History also notes that invasion planners discussed pursuing “Operation AMHINT to set up a program of assassination”—although few details were provided. In November 1960, Edward Lansdale, a counterinsurgency specialist in the U.S. military who later conceived of Operation Mongoose, sent the invasion task force a “MUST GO LIST” of 11 top Cuban officials, including Che Guevera, Raul Castro, Blas Roca and Carlos Raphael Rodriguez. When Pfeiffer first sought to obtain declassification of his critique, the Kirkpatrick report was still secret. The CIA was able to convince a judge that national security would be compromised by the declassification of Pfeiffer’s critique which called attention to this extremely sensitive Top Secret report. But in 1998, Peter Kornbluh and the National Security Archive used the FOIA to force the CIA to declassify the Inspector General’s report. (Kornbluh subsequently published it as a book:Bay of Pigs Declassified: The Secret CIA Report on the Invasion of Cuba.) Since the Kirkpatrick report has been declassified for over 13 years, it is unclear why the CIA continues to refuse to declassify a single word of Pfeiffer’s final volume.